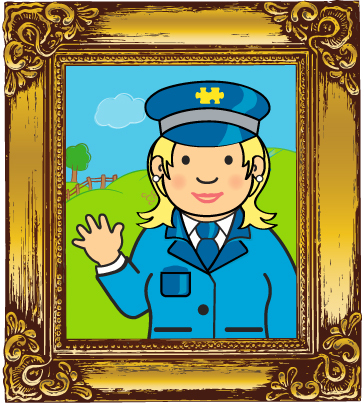 Come and meet the trusty Bigjigs Rail Crew who work hard to ensure the trains run smoothly and the passengers stay safe and happy. Be sure to look out for them in your local toy shop, on packaging and in the kids zone too! 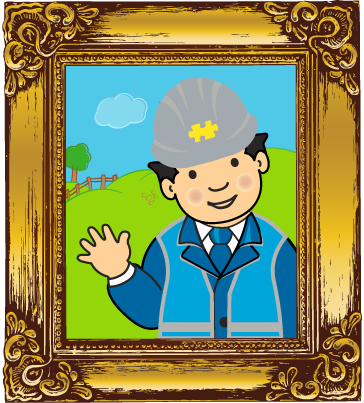 Hello everyone, I am Station Master Sam! It is my responsibility to look after the entire Bigjigs Rail Network, guaranteeing that all of our trains run safely and on time. I run a very tight ship (...or should that be train? ), to ensure that you, our passengers, have the most fun on the Bigjigs Rail Network. Most of the time you will find me at the Railway Station blowing my whistle and holding out my paddle, though from time to time you may find me onboard the trains, in the engine sheds, or inspecting the wooden railway track. Favourite Train: My favourite train is The Flying Scotsman because it is really, really, really fast! Favourite Train Journey: I love travelling around the Mountain Railway Set – climbing up over the bridges on one side and whizzing all the way down the other! Hey Gang, I am Conductor Carrie! You’ll normally find me on the train selling and checking tickets, chatting to all of the passengers and making sure everyone is having a pleasant journey! One of my favourite things to do on board is the announcements... “Bing Bong! 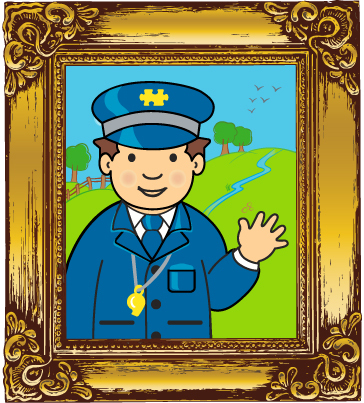 Welcome aboard the Bigjigs Railway Network, where imaginations come to life!” Listen out for me! Favourite Train: It has to be the Battery Steam Engine! When Train Driver Tom is busy driving other trains, we put this engine on cruise control and it takes us straight to the destination! Favourite Train Journey: I love visiting other places so I adore travelling on the Around the World Set. We go from London, to Paris to New York in a matter of minutes! Hello Bigjiggers, I am Train Driver Tom! I am the one who drives all of the trains making sure all of the passengers get to their destinations on time. I also make sure our engines are looking their best by doing regular check-ups and taking them through our Train Washer. Be sure to wave to me if you see my train coming – and listen out for the “toot toot” as I go past! Favourite Train: I love the Rocket Engine because of its history and I love seeing the steam rise from its chimney! Favourite Train Journey: I like chugging around the Transportation Train Set – seeing all of the planes, helicopters and cars busily hurrying around! Beep Beep! I am Motorway Manager Mike! It is my job to keep traffic moving around our Bigjigs Roadway system, ensuring our Road & Rail Link Items are connected properly and in fully working order. I also help the Construction Team fix and repair any issues we come across in the road. Favourite way to travel: In one of the bright yellow diggers, it’s great fun! Favourite Train Journey: There is nothing better than a day on spent on the Rail & Road Multi-Level Crane Set; it combines the best of rail and road, perfect for someone like me! Woof! I am Archie the Dog! Woof! 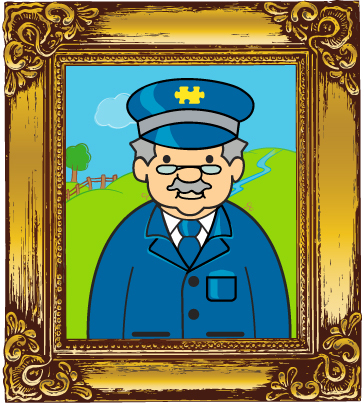 I do not really have a job, but I go wherever Station Master Sam goes! If I am lucky and on my best behaviour, sometimes I get a scrap of food or a pat on the head from our passengers! 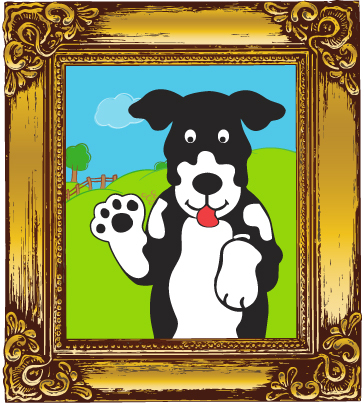 I also like causing a little bit of mischief by leaving my bones all over the place – keep your eye out for them all! Favourite Train: Woof! My favourite train is the Sleeper Train, because I like sleeping and dreaming of bones! Favourite Train Journey: Woof! It has to be the award winning Figure of Eight Train Set; it's so much fun going around and around and around and around and around! Woof!